CCL 917990 nancie@nanciechopp.com (530) 647-9772 Pollock Pines, Ca. 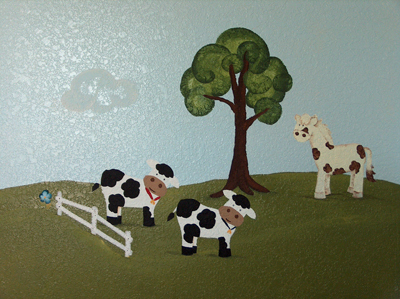 These happy farm animals were painted in a baby's room. 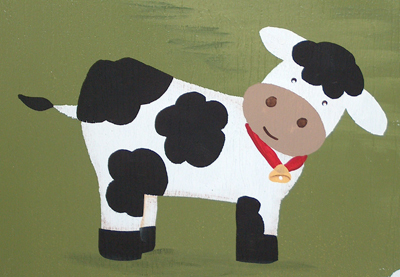 They are painted in an interactive way so that as she grows up, she will enjoy learning her colors and numbers - 1 sun, 2 mud puddles, 3 trees, 4 horse, 5 cows, etc. 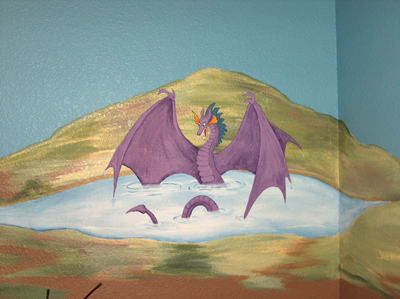 This dragon playroom was created for a special 6 year old with a love of dragons. His one word testimony was, "Awesome". 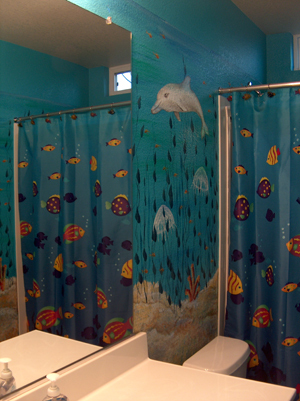 In this bathroom, we used the homeowner's already very bright blue walls to update the theme from Nemo to something that kids and adults would both enjoy for a long time. This was part of my Home Show display in 2007. Although I don't use the canvas anymore, it still makes me smile. I love these happy little creatures! 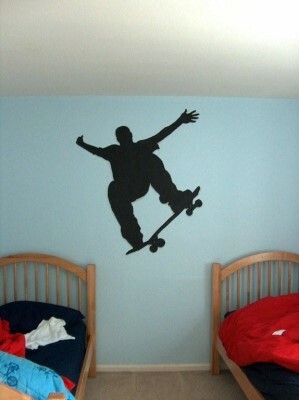 Simple sports silhouettes are a great graphic treatment to add to a kid's room - particularly when the kids are between the ages of 10-18. Bold colors and images are used, with a bit of drop shadows, to create a 3D effect. 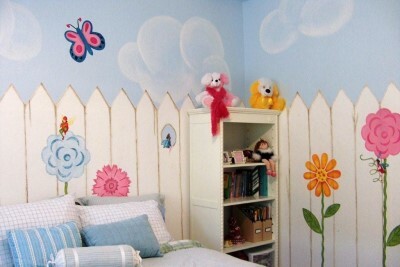 In this little girl's room, we were inspired by her bed linens and some photos mom saw in a magazine. 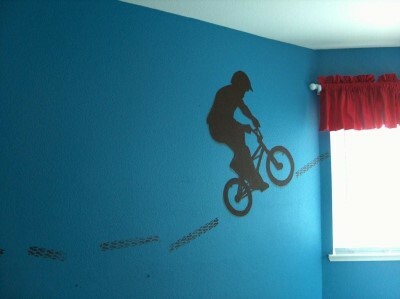 I designed these stencils to reflect the clean lines and bright colors in the room. 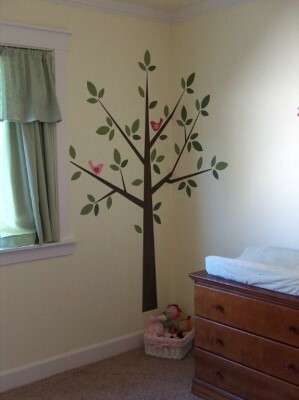 We didn't want to add clutter to this medium sized room, so one tall tree did the trick. Also, using the large space above the crib allowed us to create a special reminder of Who is watching over this precious girl. Mom agrees, these motifs should last her well into her grade school years. 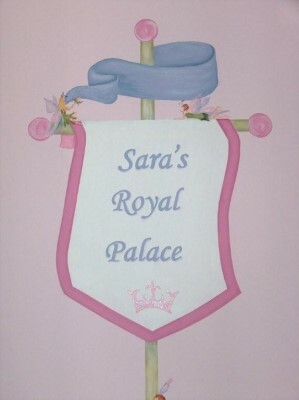 Sara's little palace is complete. 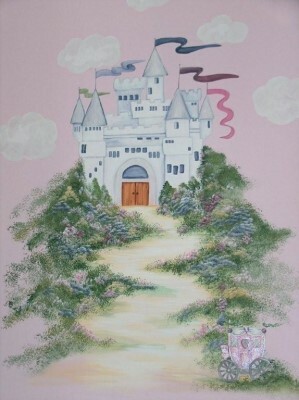 She has her very own castle, complete with gilded carriage, and a large banner guarded by a noble dragon. We used all the customary princess colors - pinks, purples, blues, and greens - and of course, a lot of glitter. 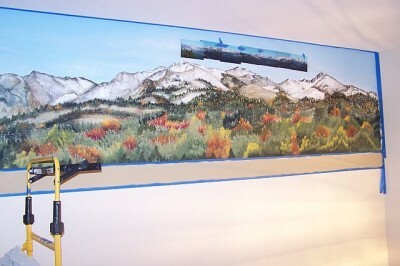 The inspiration for this room is the Crystal Mountain Range in the Sierra Mountains in Northern California. 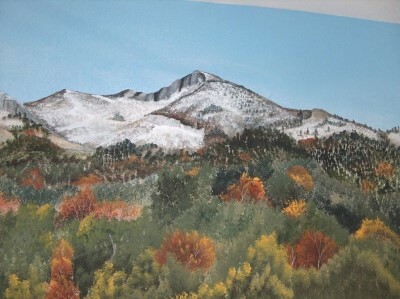 It is an awesome sight, especially with snowcapped mountains and multi-colored foliage in the foothills. 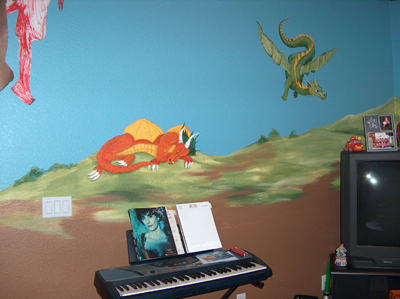 By placing the mural on the lone long wall of this room, furniture can be moved around without covering up the mural. 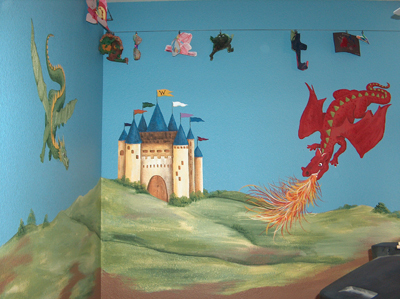 The little boy who now lives in this room loves to make up stories about climbing the mountains, finding bear, seeing stars and climbing trees. 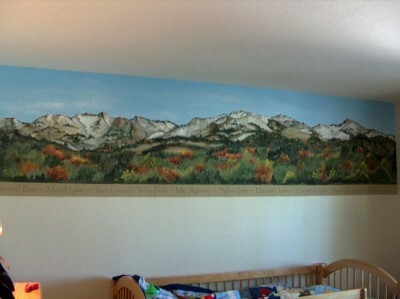 We stenciled several names of the peaks and passes and created a border on the bottom. 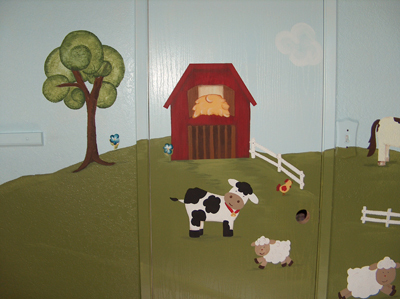 I painted this 5-wall mural for a little girl several years ago. 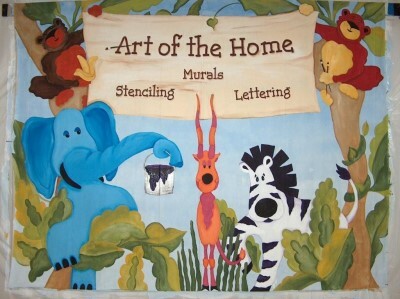 What's a 5-wall mural? That's a mural that involves all four walls AND the ceiling. Dad painted the ceiling blue and the walls (up to 4') white. 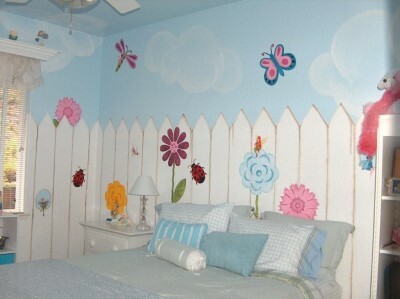 I completed the look by painting the pickets, flowers, fairies, butterflies, and clouds. Over the years, Mom has changed the bedding, furniture, and accessories. Now that the "little" girl is nearly 13, the room still fits her lifestyle, complete with a double bed, flat screen TV and cell phone. 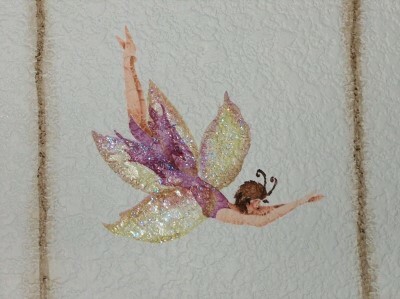 We recently added some fairies, just to freshen up the look and bring more whimsy to an already fun room. 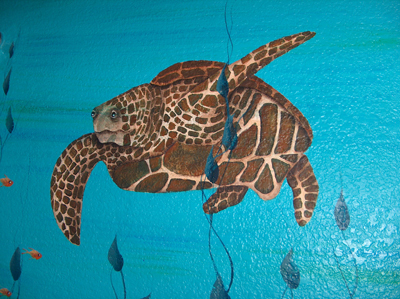 I designed this room to match the linens and artwork the homeowner purchased for her boy's room. I took a standard stencil and created various scenes with the different types of dinosaurs. 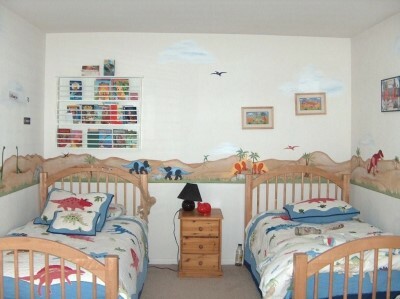 Although no one really knows what colors the dinosaurs were, it was fun using bright colors and a bit of whimsy to create this dino room for these boys. 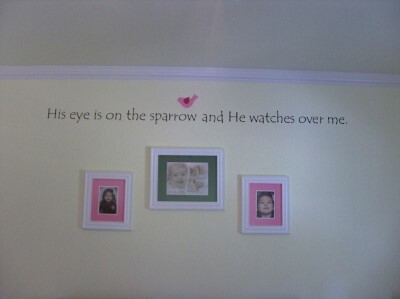 For this baby's room, I used a variety of images to create these playful monkeys. These bright colors are sure to attract the attention of any child and it is a theme that Zack will enjoy for a long time. This room is a good example of combined freehand and stenciling techniques with custom lettering for the sign. 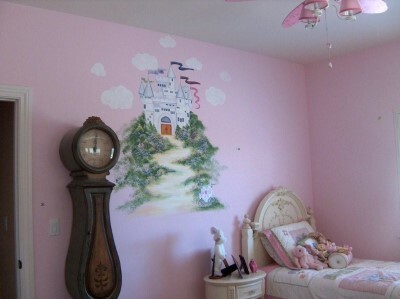 This room was painted for a spunky 3 year old with a love of fairies. The room is full of them and when I came by to take pictures, she told me each of their names! I surrounded a little girl with giant happy flowers and friendly bunnies. 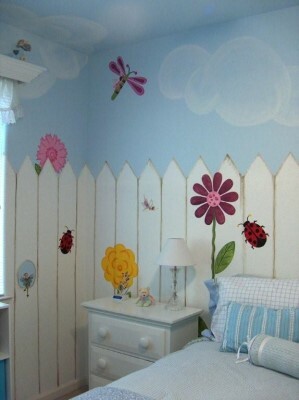 I added big butterflies and bees to happily buzz her to sleep every night! 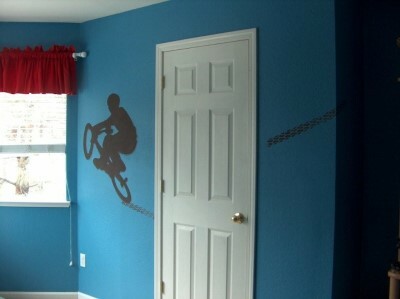 This room features mostly traditional stenciling techniques, with a few free-hand techniques thrown in. 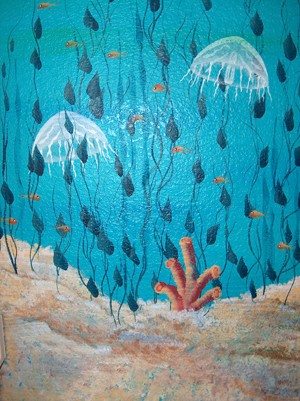 In this little boy's room, I created an underwater world complete with oversized happy fish and glow in the dark jellyfish.